Joyce Yarrow brings back Jo Epstein, New York City private investigator and performance poet, in the sequel to Ask the Dead. The Last Matryoshka starts out in Brighton Beach, and the Russian community there, but Jo will find she's in the greatest danger when she follows her case to Russia. Jo's surprised to get a call from her stepfather, Nikolai, since they've never been close. But, they both love Jo's mother, Ruth. And, she's suspicious of Nikolai when he tells her some off-the-wall story about a murder in an elevator, and that he was set up so it looks like he killed a man. He hires Jo to investigate, but the case quickly escalates when he receives a nesting doll, a Matryoshka, with a message inside. "You ruined my sister. Now you will suffer." Jo knows Nikolai knows more than he's telling, but she's forced to work with the man she doesn't trust in a case that leads to undercover cops and fake fashions. Finally, in order to protect her mother, she follows her stepfather, and the case, to Russia. Why? Her mom's husband is "Up to his neck in illegal activities and may or may not have been framed for murder." But, it's family. The Last Matryoshka is a multi-layered complicated story, best represented by those nesting dolls with one story inside another. It's a story of family, Russian criminals known as the vory, and history. Somewhere in Nikolai's Russian past is a story worth killing for, and Jo Epstein is determined to discover it. She's an admirable character, an investigator willing to set aside her feelings to protect her mother. It's not an easy story to read, with a full cast of undercover cops and Russian names. But, it's a story that explores the past, Russia, and relatiionships. You'll want to discover the secrets buried in The Last Matryoshka. 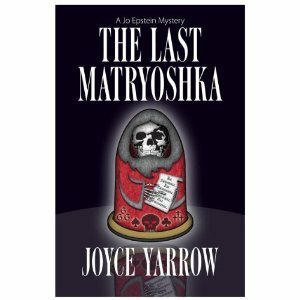 The Last Matryoshka by Joyce Yarrow. Five Star, ©2010. ISBN 9781594148873 (hardcover), 274p. FTC Full Disclosure - The author sent me an ARC, hoping I would review the book. I want to- I'm a sucker for books about Russia and this one looks like fun! I think you'll especially enjoy the part of this book set in Russia, Maria.